The Helios Modular Masonry Heater presents a new concept in hearth products. Consumers enjoy comfortable, high-quality radiant heat from an environmently friendly Slow-Heat-Release Appliance, without the expense of custom construction and installation. The ecologically minded consumer base feels confident purchasing a heater fueled from a renewable resource of wood. The Helios fulfills this vision. Primary delivery of the heat is from radiant masonry, rather than the short fire. The innovative firebox has corrugated firebrick walls, with 360 degrees air injection. This yields the best combustion and a quick hot fire. The cutting-edge heat absorbing flues wind over 16 feet, extract and store the heat from the batch loaded fire(12 hours). As the burning process nears completion, there is a glowing bed of charcoal with short blue flames. At this point the air intake is fully closed with no further particulate emissions resulting. Best of all, this unit test only .384 g/kg (.217 g/hour on a 12 hour firing cycle), a new benchmark for the hearth industry. The original modular nature of the Helios allows ease of construction as well as mobility of the appliance, unlike other masonry heaters. 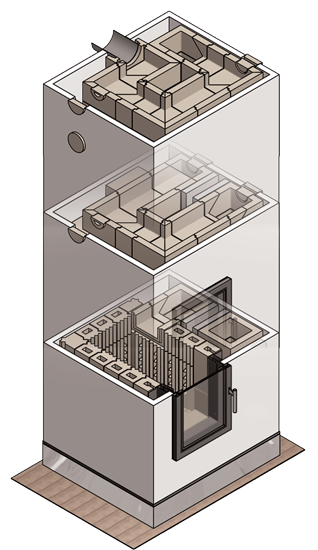 When the homeowner moves, the unit can be disassembled and reinstalled.